What To Wear On Halloween? | Awesomeness For Awesome's Sake. What To Wear On Halloween? Thanks to My most favoritest Auntie and Unkle over at KINDERTRAUMA, I have found the perfect costume for myself this year! That’s it, right there on your left! Isn’t it the most awesome thing you’ve ever seen? 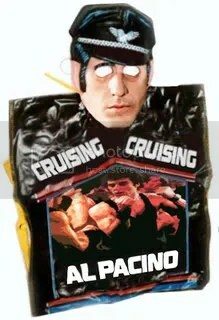 I’ve expressed my love for William Friedkin‘s CRUISING for decades…and I never knew they actually made a Halloween costume for deep, deep, and I do mean deep, undercover officer, Steve Burns! Oh, and get this, it has assless chaps! Super-sweet! What are you guys going as this year? Need some ideas? Be sure to check out the rest of The 10 Worst Halloween Costumes only at Kindertrauma, of course!